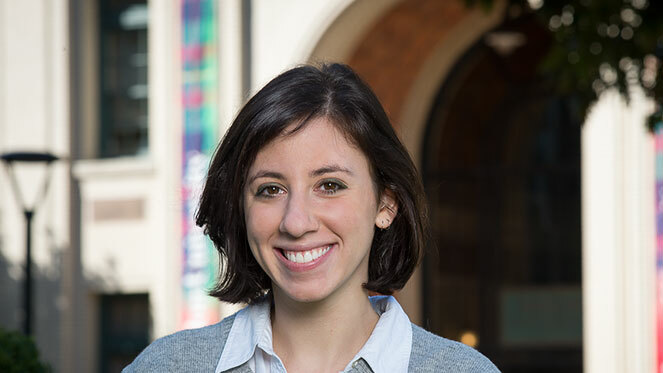 Maya Schumer (DC ’16) has been accepted to the National Science Foundation’s (NSF) highly competitive Graduate Research Fellow Program. Schumer, who graduated from Carnegie Mellon University with a degree in psychology, was one of 2,000 to receive the award from a pool of over 13,000 applicants. Schumer’s exposure to cutting-edge research began during her first year at CMU when she joined Associate Professor of Psychology David Creswell’s Health and Human Performance Laboratory. She worked under his supervision for her Dietrich College Senior Honors Program thesis as she investigated the effectiveness of brief mindfulness training. She also was part of a brain imaging study that assessed self-affirmation as an intervention for stress, funded by a Small Undergraduate Research Grant (SURG). Since graduation, she has continued to work in the lab as a post-baccalaureate research assistant. "Maya Schumer is a bright and enthusiastic student with such a bright future," Creswell said. "I’m delighted to see that the NSF recognizes her star potential." The fellowship will provide her with a $34K per year stipend for three years as she pursues a Ph.D. in psychology at the University of California, Los Angeles (UCLA). Her research will focus on using Multi-Voxel Pattern Analysis (MVPA) to study and decode the neural biomarkers of anxiety and depression. "Using machine learning to understand psychiatric and affective disorders is a young and emerging field, so there's still so much to discover, like ways to improve what has already been done, new paradigms to develop, and techniques to modify," Schumer said. "It's also a cross-disciplinary field, fusing computer science, statistics and neuroimaging, so the research takes on a multi-modal approach to both predict clinical outcomes and inform our understanding the human brain overall." At the core of her research, however, is her passion for mental health advocacy. As a student, Schumer helped to found the CMU chapter of Active Minds, a national organization with a mission to raise awareness of mental health issues on college campuses. "We see a dentist to take care of our teeth and a physician to take care of our body. But why is there a stigma around seeing a therapist or psychiatrist to take care of our brains? I'd like to continue to reduce the stigma around mental health by speaking openly about it and educating others, through both my research and social interactions," she said. Schumer added, "I tried to take advantage of all the research opportunities Carnegie Mellon had to offer, as it is a strong research institution."